Home >> Generated from JAN's SOAR Information System on 4/21/2019 12:10:42 AM. The Bakker Elkhuizen S-board 840 Numeric Keypad is the ideal solution for anyone who has the S-Board 840 keyboard or any true ergonomic keyboard. The advantage of this high-quality, compact, lightweight keypad is that it can be placed anywhere on the desk, so you can choose the most relaxed posture for your own shoulders. May of course be used on the left. 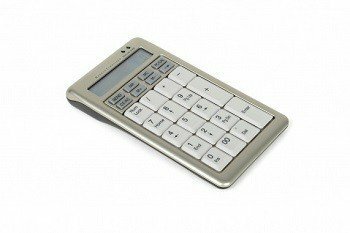 This numeric-keypad is USB compatible and has a built in calculator function! The num pad has 26 different keys. This small, portable num-pad is perfect for use with a laptop as well. The shorter distance from the mouse to the keyboard helps reduce RSI.